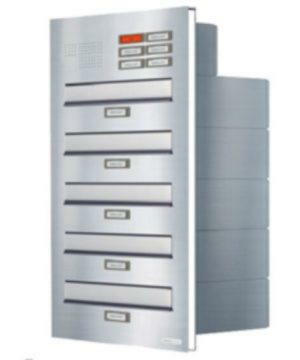 A high capacity mailbox for apartment buildings, office blocks and student accommodation, the H260-2 horizontal post box offers a generous storage capacity of 21.45 litres within compact dimensions of just 260 x 220 x 375mm (width, height, depth). Large enough to accommodate A4 size letters without folding or bending the envelope, it is the ideal letter box solution for private residences and professional working environments alike. EN13724 approved. 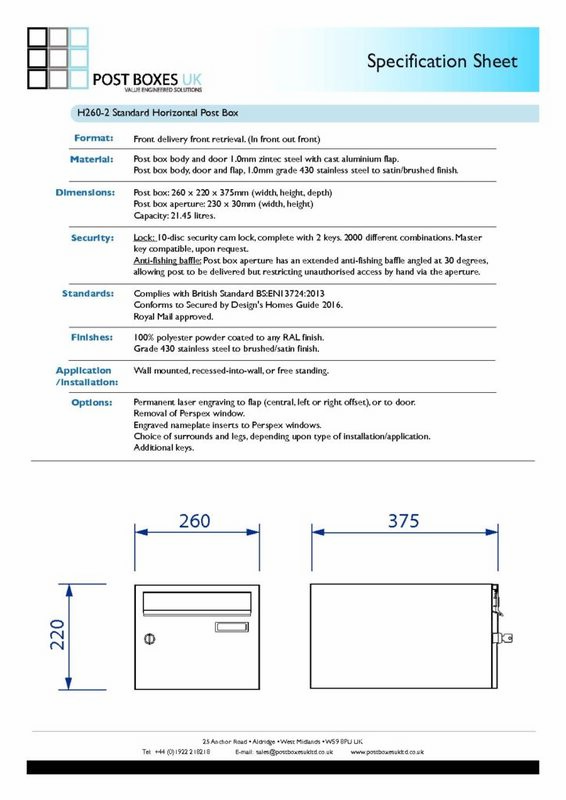 The H260-2 Secured by Design mailbox can be installed as a single free-standing unit or combined with other models to create an entire letterbox bank for larger buildings. At Post Boxes UK, we offer a full customisation service including schematic drawings and installation, with any configuration possible. Application of the H260-2 Horizontal Mailbox is easy. It can be wall mounted or wall recessed to create a more permanent structure or left as a free-standing post box with support legs. Fully customisable to complement every apartment block, business property, or student accommodation, the H260-2 horizontal mailbox is offered in a choice of standard RAL, non-standard RAL, and multi-RAL colour options. Flame resistant/fire retardant finishes are available to meet strict Building Control and Fire Regulations, and laser engraving is available for those who would like to personalise their letterboxes with numbering or branding. Lead times for bespoke H260-2 mailbox configurations are approximately 4 weeks, depending on the complexity and size of the design. Please contact us to discuss your project requirements. Manufactured from a robust 1mm electro-galvanised steel and stainless steel, the H260-2 communal letter box is rust resistant, weather resistant, and suitable for both indoor and outdoor applications. Further mailbox customisation comes in the form of finishing surrounds, which include no surround, 2mm – 20mm casing surround, or a 20mm / 40mm recess trim surround. This works particularly well on recessed multiple occupancy mailboxes where you want to create a smooth flush finish, and on outdoor applications where optimal weather resistance is required. The H260-2 freestanding mailbox is offered with a choice of leg supports, including side legs attached to either side of the post box bank, and pedestal legs that sit neatly beneath the bank of letter boxes. Combinations of the two are available for larger mailbox banks. To meet the recommended height requirements for EN13724 compliance, mailboxes should be no higher than 1800mm from finished floor level. At Post Boxes UK, we can supply mailbox support legs to meet any specification. As with all the mailboxes in the Post Boxes UK collection, the H260-2 apartment mailbox can be customised with apartment numbering and nameplate inserts. Both laser etching and engraving options are available upon request. The H260-2 communal apartment letterbox comes with a non-mastered Eurolock Cam Lock as standard. Post Boxes UK offers a range of alternative locking options such as mastered cam locks, combination locks, push button digital locks, and RFID/NFC proximity locks for those looking for a more integrated locking system for high-risk areas. Please contact us to discuss your requirements. Replacement keys and locks for the H260-2 commercial mailbox are available at Post Boxes UK. Discounted rates are offered for bulk orders, and lock system upgrades are available for those who would like to enhance the security of their current multi-unit mailboxes. The H260-2 wall-mounted mailbox meets the requirements of the police initiative Secured by Design as listed in the Homes Guide 2016. With its anti-fishing baffle it is highly effective at preventing mail theft and unauthorised access. 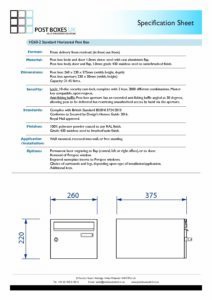 The mid-size model in this best-selling range, the H260-2 multiple occupancy mailbox works well in high-occupancy student accommodations, busy office reception areas, and low-rise apartment buildings that receive a substantial amount of mail each day.